Looking east from Jerusalem Avenue at the outfield of the Polaris Drive ball field in Levittown. 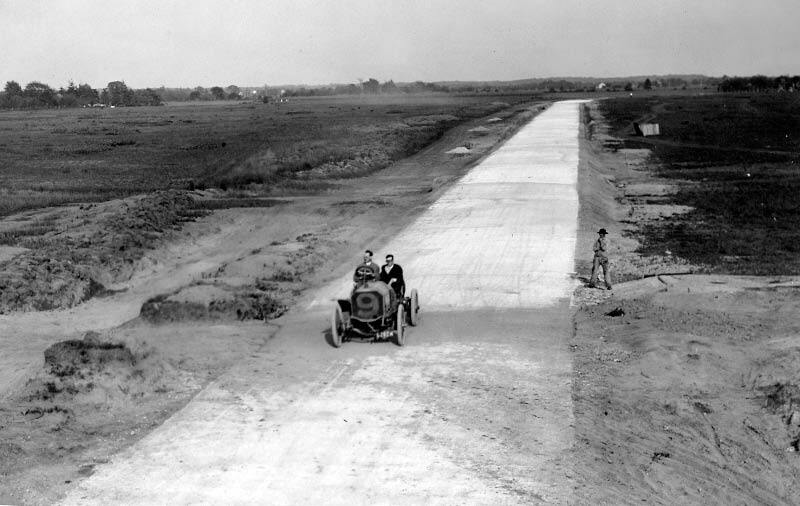 The same view was seen on September 23, 1908 when Joe Tracy was testing the Motor Parkway (see below). Which Vanderbilt Cup Races were held on this section? Three Vanderbilt Cup Races: 1908, 1909 and 1910. Other races included the 1908 Motor Parkway Sweepstakes and the 1909 and 1910 Sweepstakes that were held concurrently with the Vanderbilt Cup Races. What do you believe is the reason for the footprint? It is likely that Motor Parkway remnants or the actual road are under the footprints. Where are other Motor Parkway footprints? 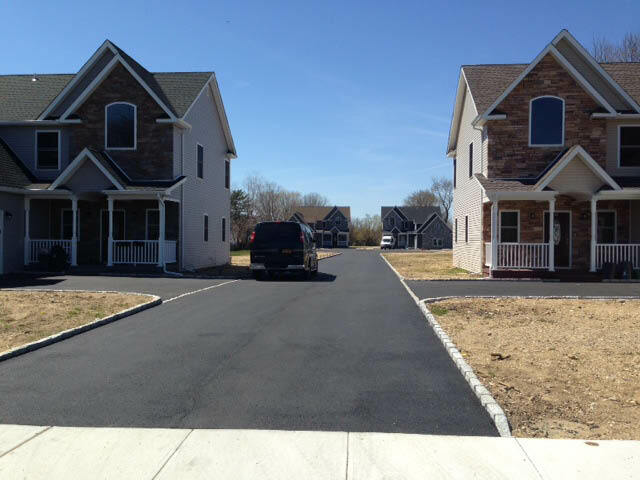 The best footprints can be seen in Levittown form Heron Lane (west) to the new Polaris Field (east). As noted in the Comments section, there are numerous footprints throughout the Motor Parkway right-of-way. Congrats to Greg O., Brian McCarthy, Porter Michaels, Tim Ivers, Steve Lucas, Michael La Barbera, Joe Oesterle and Frank Mendyk for identifying the Levittown as the Mystery Foto location. Kudos to Sam Russo, Art Kleiner and Frank Femenias for contributing to this Mystery Foto. Please forward your suggested Mystery Fotos to Howard@Kroplick.com . Location of the Motor Parkway east of Jerusalem Avenue. Submitted by Frank Femenias. The path of the Motor Parkway west of Polaris Field. The path of the Motor Parkway east of Polaris Field. The exact same view as above as seen on September 23, 1908. Taken from the Jerusalem Avenue Bridge, veteran driver Joe Tracy made several test runs on the Motor Parkway in the Locomobile which finished 10th in the 1906 Vanderbilt Cup Race and would later win the 1908 race. Tracy gave the Motor Parkway a great review: "The cement highway makes an excellent racing road." As seen in 2016. Submitted by Art Kleiner. Looking East from Jerusalem Ave at the outfield of the Polaris Drive ball field. -Which Vanderbilt Cup Races were held on this section? -What do you believe is the reason for the footprint? Possibly due pavement remnants under the ground cover. -Where are other Motor Parkway footprints? 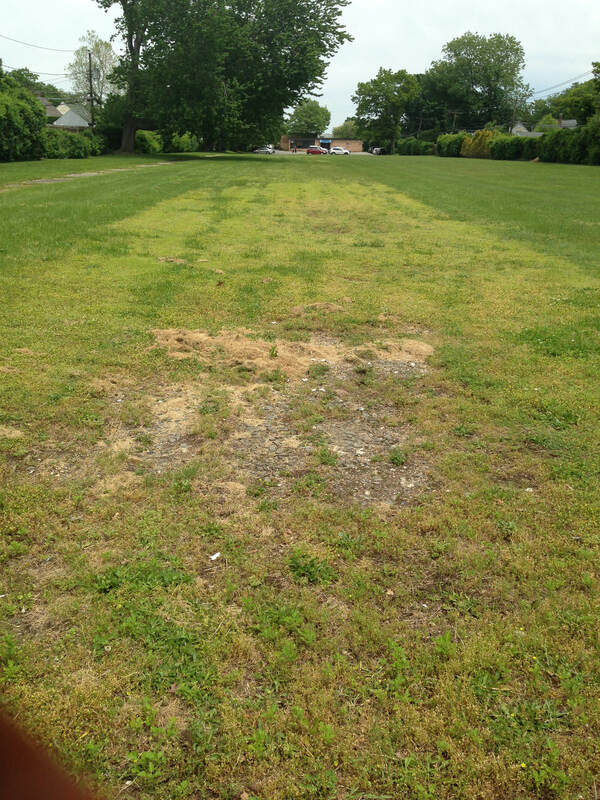 *Location: Photo is facing east on Polaris Field between Jerusalem Ave and Drainage Basin. *Footprint Theory: The stretch of the LIMP from today’s Pintail La east thru Levittown was constructed in a manner to avoid road flooding, with drainage culverts situated thruout. 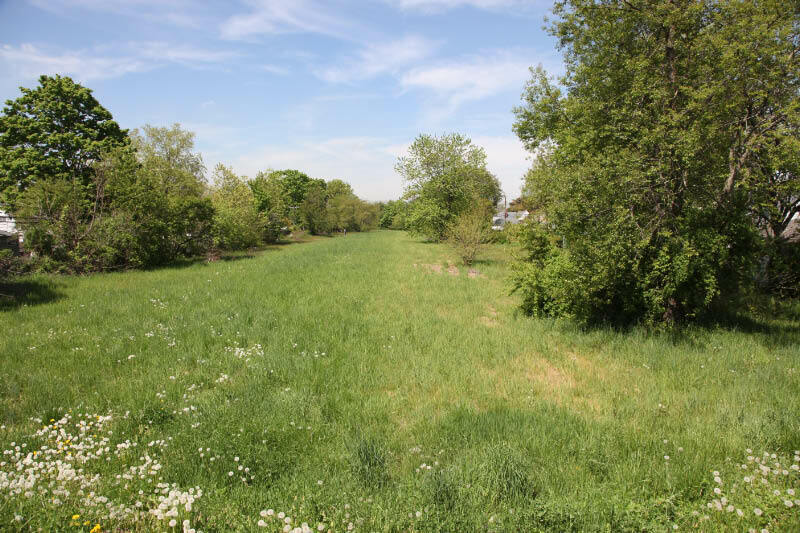 At some point after the LIMP was closed, both sides of the parkway had to be filled in/leveled off to offset flooding problems for the Levitt homes. It appears there’s not enough topsoil on the old pavement. So the grass doesn’t green up nicely at these locations. * Crocus La west to Drainage Basin. Polaris Field near Jerusalem Avenue in Levittown. I’m recusing myself for the rest of this question to be fair. Jerusalem Avenue looking east near Orchid Rd. 1908-1910 races passed this way. Footprints would indicate the presence of pavement underground. Other similar footprints are directly west along an undeveloped path between houses almost to Newbridge Road. 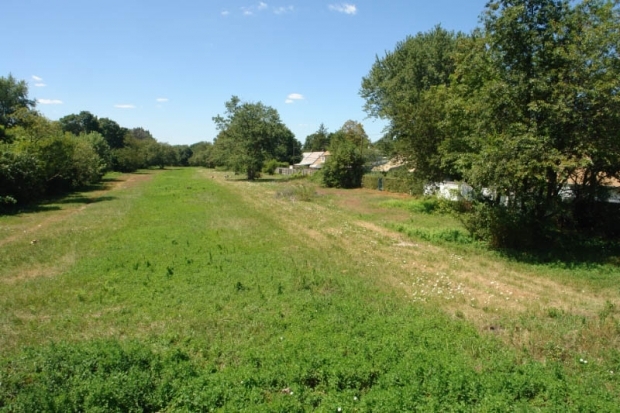 I think the photo was taken in Levittown in the area surrounded by Crocus & Skimmer Lanes, Orchid & Blacksmith Roads. The 1908, 1909, & 1910 races all ran through this section. I think the LIMP road surface is just slightly below the grass thus not allowing for a substantial root system to develop causing a difference in coloration. Two other “footprint” areas that come to mind are just north of deadman’s curve near Sophia Street and in the vicinity of Maxxess Road. Levittown, site of the Grandstand and Pressbox by Orchid and Crocus Street is my guess, home of the 1908 1909 and 1910 races. Other footprints are numerous. I like to hike around Dead Man’s Curve and explore behind Roosevelt Field. This appears to be in Levittown. This could mean our favorite pavement is hiding under the surface. All three races using the LIMP passed this location. 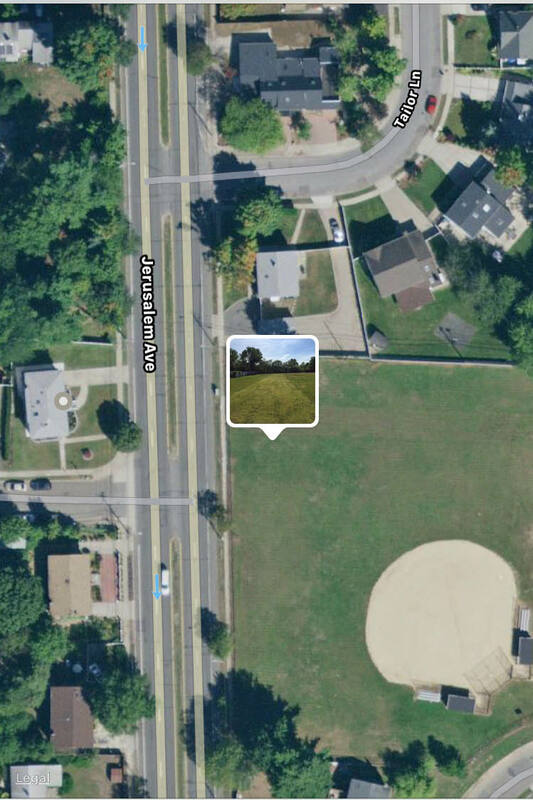 The photo of the Motor Parkway footprint is located in the Polaris ball field park just east of Jerusalem Ave, Levittown. The 1908,1909 and 1910 Vanderbilt Cup races were held on this section. The 1908 Motor Parkway Sweepstakes and 1909,1910 Massapequa Sweepstakes was also held on this section. The reason for the footprint was due to dirt fill being placed over the remnants of the parkway pavement. Several other footprint sections in the area are 1).The new Polaris ball field(next to the Polaris field), 2). ROW from Crocus Lane to Laurel Lane (Elija School), and 3). Heron Lane to Skimmer Lane (a small section). I think that the old b&w photo below Dave Russo’s “now” color photo was taken from the opposite direction. Dave’s view is in the direction of the bridge, and you say that the old pic was taken FROM the bridge. I think it’s time to call in Sherlock Holmes.